The Vice-Chancellor, Prof. Olusola Oyewole, displaying a copy of the 2011/2012 Annual Report at the meeting. Inset: Prof. Sam Otubusin addressing members of the Congregation during the meeting. The Vice-Chancellor, Professor Olusola Oyewole, has given account of his stewardship since assumption of office, about 12 months ago. Reiterating his commitment towards making FUNAAB a world class University in a short presentation titled, Moving FUNAAB forward to become a World-class University, the Vice-Chancellor, at the first Congregation Meeting, since the beginning of his administration, said that he had been guided by the vision to promote the advancement of FUNAAB towards a World Class Citadel of learning, provide visionary leadership, empower the workforce, promote quality and excellence in the University’s focus areas and ensure that the University makes an impact on the society. To this end, Professor Oyewole noted that through the collective contribution by the University Community, the current administration had provided focused, transparent, disciplined leadership which had aided the entrenchment of a stable university calendar. Emphasising the importance of staff capacity building in achieving the vision and mission of the University, he disclosed that over 71 members of staff had attended conferences and workshops all over the globe in the academic and non-teaching staff cadres. He added that capacity building was not limited to staff alone, and that the current student leaders had also undergone a special leadership programme. In addition, he hinted that Management was also working towards ensuring that academic staff without PhDs are given the opportunity to acquire the degrees. Professor Oyewole stated that during the period under review, the University’s College of Engineering had received full accreditation from the National Universities Council (NUC) as well as the Council of Registered Engineers of Nigeria (COREN). In a bid to realise the University’s dream, the Directorate of Academic Affairs had produced the University’s Annual Report for 2012, he added. On financial matters, Professor Oyewole dismissed the insinuation making the rounds that the University lacked funds as ‘a cheap blackmail’, when he said “the only thing that we are doing is that we are being prudent with the way we are spending our money. I want to appreciate that our government funding for personnel has been consistently timely in the past 12 months and that is why you all receive your salaries on or as at when due”. He said the Tertiary Education Trust Fund capital grant was inaccessible because the University had two outstanding projects and that by the time the projects were completed; the University will have about 600 million naira to spend on capital projects. The Vice-Chancellor also noted that the Commencement Lecture, which was designed to begin a new academic session, was introduced recently and the Office of Advancement was established, while the University increased its Inaugural Lectures from three to six. 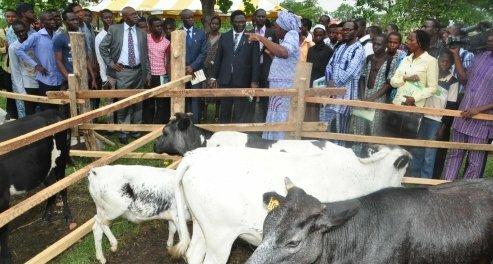 Professor Oyewole said the University was also working towards producing a new Academic Brief and Calendar, as he solicited for the support of the entire members of the University Community and other stakeholders, stressing that moving the University to a world-class status demanded the collective contribution of all.